House of Thule is EverQuest's 17th expansion. It was announced on August 6, 2010, with an official launch date of October 12, 2010. The initial announcement may be found here and the expansion release patch message may be found here. Check out this link for a list of zones in the House of Thule expansion. 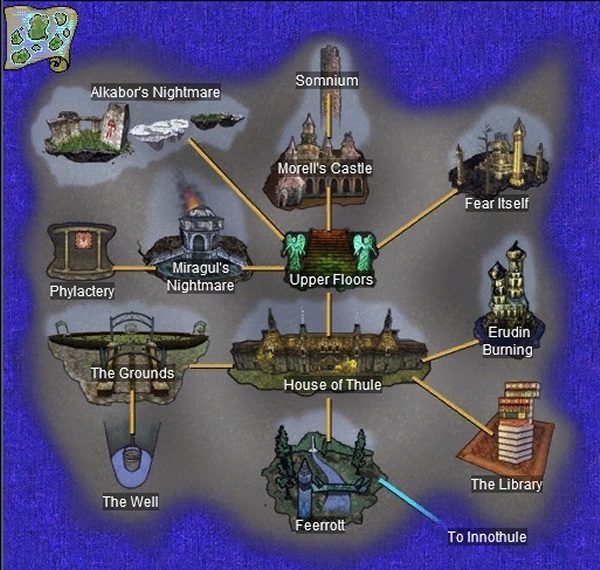 A screenshot of the in-game map of zone connections can be found here. Click on the statue on the banks of low level Feerrott's Greenblood River (ports you to the new Feerrott). Use the Guild Hall portal to port to the new Feerrott. Wizard and Druid port spells to The Grounds. Vendors are at location -1375, 665, 2 in the new Feerrott (southern boundary outside the House of Thule zone). These spells result from Nebulous Dream Fragment turn-ins. Fragments are droppable. Spells are NO TRADE. See Kaelynn Stearns in the Feerrott (location 520, 2800, 30). You can request a task from her to do your spell turn-in and actually choose which spell you want. Note: Some Rk. II spells may require amiable Dream Delvers faction. These spells result from raid turn-ins. Fragments and spells are NO TRADE. See Spensur in the Grounds (location -60, -1685, -100). As with the Rank II spells, you request a task from him and can actually choose which spell you want. Note: Some Rk. III spells may require amiable Dream Delvers faction. This page last modified 2014-12-18 23:13:39.